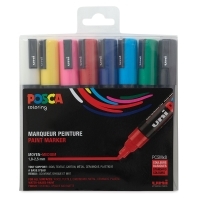 Mark in vivid color on practically any surface! 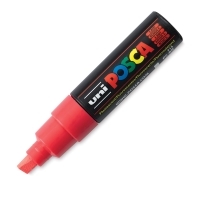 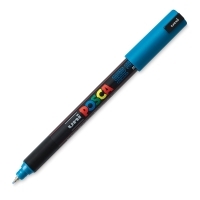 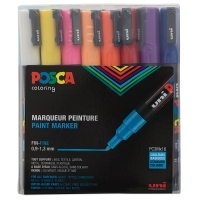 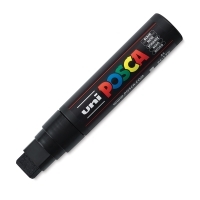 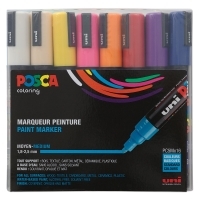 The opaque, waterbased ink in Uni Posca markers dries to a matte finish on both porous and non-porous surfaces. Odorless, fadeproof, and bleedproof, the markers are great for posters, signs, sketching, lettering, graphs, and charts. Use them on paper, matboard, wood, styrofoam, metal, plastic, vinyl, glass, and more. The medium (2.5 mm) tip produces neat, precise lines, while the broad (8 mm) chisel tip is ideal for covering large areas drawing curves. 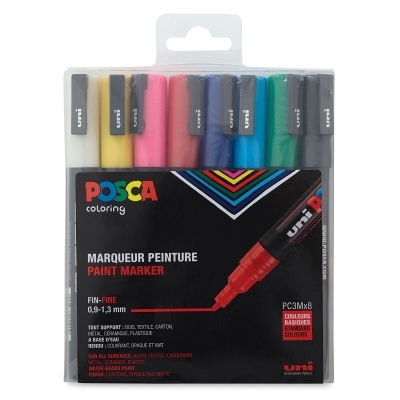 Set of 8 — Includes one each of Black, White, Red, Yellow, Blue, Light Blue, Green, and Pink. Set of 16, Bullet Tip — Includes one each of Black, White, Red, Yellow, Blue, Light Blue, Green, Light Green, Pink, Light Orange, Orange, Violet, Gray, Brown, Silver, and Gold. 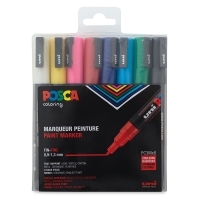 Set of 16, Medium Tip — Includes one each of Black, White, Red, Yellow, Blue, Light Blue, Green, Light Green, Pink, Orange, Violet, Beige, Gray, Brown, Silver, and Gold.